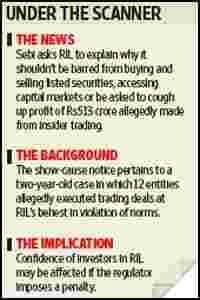 Mumbai: As part of a continuing probe, stock market regulator Securities and Exchange Board of India, or Sebi, has asked Reliance Industries Ltd, or RIL, to explain why it should not be prohibited from buying and selling listed securities, accessing capital markets, or be asked to cough up profits of Rs513 crore it had made allegedly from insider trading in the shares of Reliance Petroleum Ltd, or RPL, a subsidiary that has since been merged into RIL. The latest missive from Sebi, dated 8 October, pertains to a two-year-old case in which 12 entities allegedly executed transactions at the behest of RIL in violation of insider trading norms. In a categorical rebuttal, RIL’s external spokesperson Manoj Warrier said in an emailed statement: “RIL has always abided by all rules and regulations of Sebi and hence, has neither violated any provisions of insider trading nor has acted in any manner so as to attract provisions under Section 11(i), 11(B) and 11(4) of SEBI Act 1992." It added that the company had “accordingly, submitted our detailed reply" to the market regulator and had “not received any further communication in this regard". Calls and an emailed query to Sebi’s media relations officer elicited no immediate response. A Mumbai-based analyst with a foreign brokerage downplayed the development, saying investors will only take note of it if the regulator actually imposes a penalty or asks RIL to disgorge profits. Until then, it was just a procedure of seeking clarifications from the company, he added. Shares of RIL climbed 3.31% on Monday to close at Rs2,195.50 a share on the Bombay Stock Exchange while the benchmark index Sensex closed 0.93% higher at 17,180.18 points. Investors were enthused by news over the weekend about RIL’s “preliminary", “non-binding" bid for the bankrupt Dutch chemical manufacturer, LyondellBasell Industries AF, in what could be the biggest overseas acquisition by an Indian company. Mint had reported on 6 May that the first show-cause notice had been sent to RIL, asking it to explain transactions by 12 entities that had participated in a three-month rally that had pushed RPL’s stock to an all-time high of Rs295 on 1 November 2007. The peaking of RPL share prices was accompanied by a huge build-up of “open interest"—outstanding position of traders in the futures and options ?market—in its shares. Five days later, the National Stock Exchange banned derivative trading in RPL as open interest in the stock crossed the threshold level of 95% of market-wide position. The ban was lifted in end-November, but by then RIL had announced that it had sold 180.4 million shares of RPL, representing 4.01% of the firm’s equity, for Rs4,023 crore and the outstanding positions had reduced considerably. In early 2008, Sebi began investigating these transactions—a process that led to the show-cause notice. In a separate and independent investigation related to the same issue, reported by Mint on 20 March, the income-tax department was also looking at possible tax aspects relating to the trading by the 12 entities—ones that RIL had acknowledged to be its “agents" which paid back the entire sale proceeds net of commission and the company had duly accounted this income in its accounts for 2007-08.